Immediately striking is the design of the disc packaging here with a decidedly modern feel. Yet, it’s eye-catching in it’s minimalism and thought provoking in it’s maximilism. Contradictory? Sure. But I feel that is part of the allure here. Before delving into the sound I inspected the information attached. From the design I expected some clean kind of experimental drone music with maybe even a touch of acdemic flavor. The inside information seemed to confirm this, with a note saying all music is composed with Jeskola Buzz, free software. Information about how the artist thanks family, one of the tracks Lofun is composed in dedication to his engagement. I’m expecting something pleasing, calm, ambient. The opener Útburður Umskiptingur is not too far from what I expected. Starting off with reverberating sounds of a baby crying yet it builds into a slightly distorted wall of drones and gets perhaps a touch more harsh than what I anticipated the disc would reach. Öldungur is the first sign that AMFJ is not going to be the devil I know. This time a beat is introduced and it is one of the industrial variety. Minimal and joined by slowly chanting vocals it brings to mind the work of Haus Arafna, SPK, and Teatro Satanico. 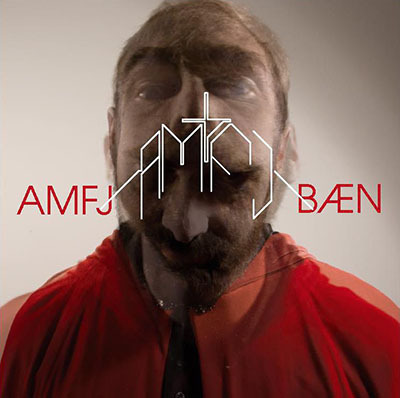 The bulk of Baen follows suit with an excellent array of industrial tinged beat driven tracks many which feature gruff vocal attacks. Those that don’t have an eye for detail like the title track which stays relatively restrained for it’s duration. Although Lofun being the most minimalist track here is a touch of a let down, Baen ends on a very strong note with Húsið Andar a soaring ambient – almost electro – track with a slight post-something feel. Somehow AMFJ still seems to hold it all together despite the wide variety of styles featured on Baen. It’s an album that shows focused intention, effort, and creativity as well as some decent technical chops. The sound doesn’t obligate itself to stick to one genre or the other but also doesn’t stray all over the map; a logical middle ground is kept. Definitely some great work which leaves me wanting more from the artist.